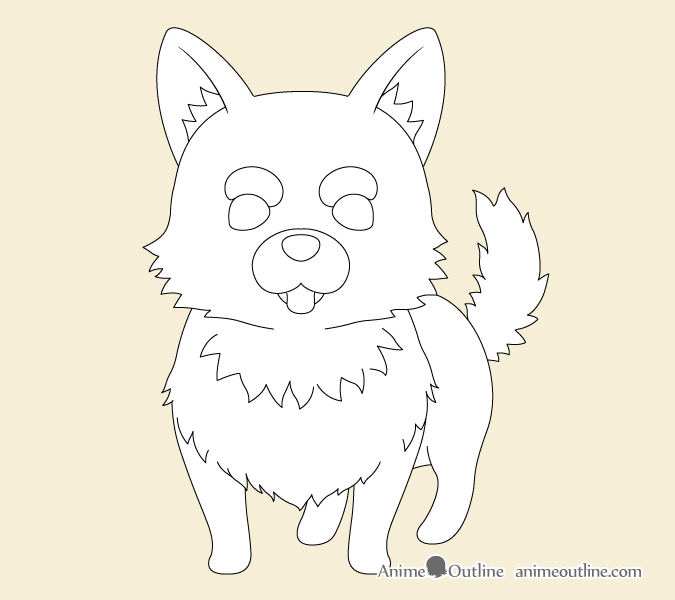 This tutorial explains how to draw a cute anime or manga style dog in seven steps going from a basic proportions sketch to a fully colored and shaded drawing. Dogs come in many breeds, shapes and sizes making it difficult to have one clear set of proportions for drawing them. This is even more so when it comes to drawing stylized anime dogs. But there are still things you can do to help you. One is approaching drawing in the right way by drawing the larger proportions first and working your way down to the smaller details. 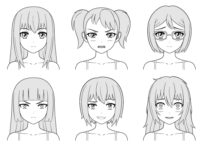 Another is analyzing the anime style to see what makes a dog look anime. 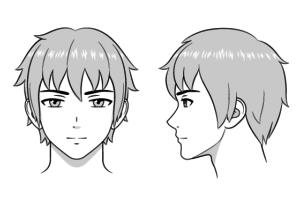 Some anime animals are drawn with proportions very close to real animals and some are very stylized. 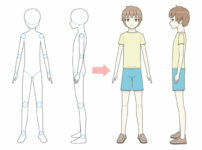 In general for anime and manga small dogs like the one in this tutorial tend to be drawn with bigger than normal heads and small than normal legs and paws. 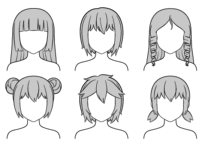 Anime animal fur tends to be drawn in clumps similar to anime hair. 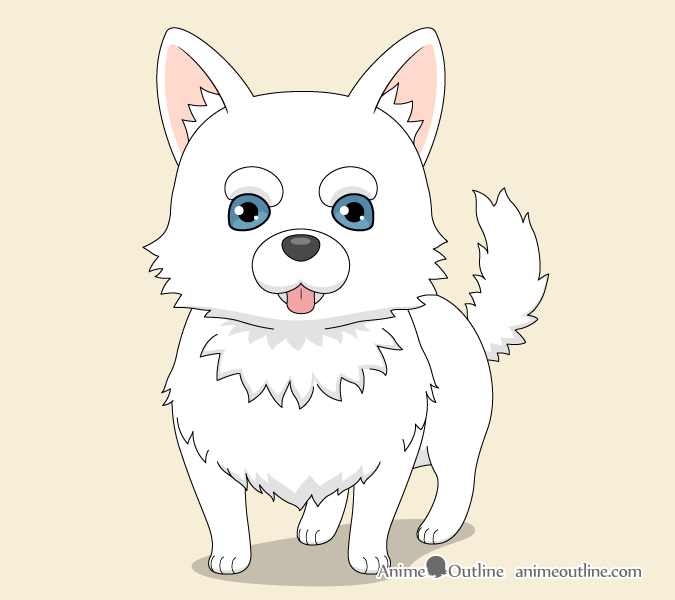 Anime dogs are also sometimes drawn with bigger more human like eyes then real dogs. In this case we will draw fairly normal sized eyes for a dog of this type as small dogs already tend to have big eyes in relations to their bodies. 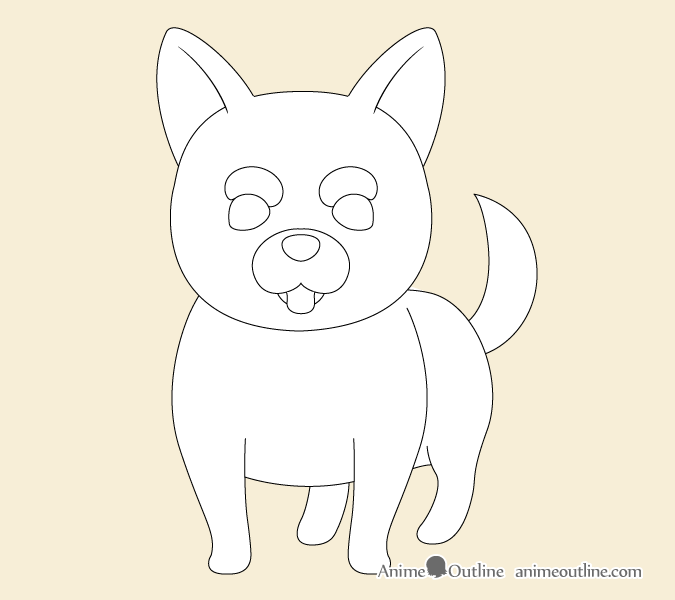 Start by drawing two rough shapes for the head and body of the dog. The goal of these it to get the size and overall shape for each. Moving down to the smaller body parts of the dog draw the general shapes of the legs, ears and tail. To make the dog look cute draw the facial features fairly low down on the dog’s head. 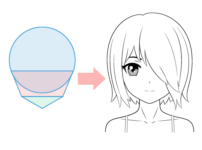 Draw the eyes with the top curve being larger than the bottom and draw the eyebrow shapes right over top of them lightly curving around the top part of the eye making a “bean” like shape. Draw the snout/mouth close to two half circles for the bottom of the top jaw and one half circle for the lower jaw. 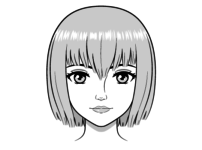 Draw the nose close to a triangle with rounded corners. Finally you can also draw the dog’s tongue sticking out of its mouth. Drawing the tongue and the tail the way we are doing in this example gives the dog an exited (happy to see its owner) type of appearance which can add to the cuteness. 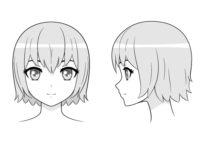 As already mentioned the fur for an anime dog can be drawn similar to anime hair, in small clumps. 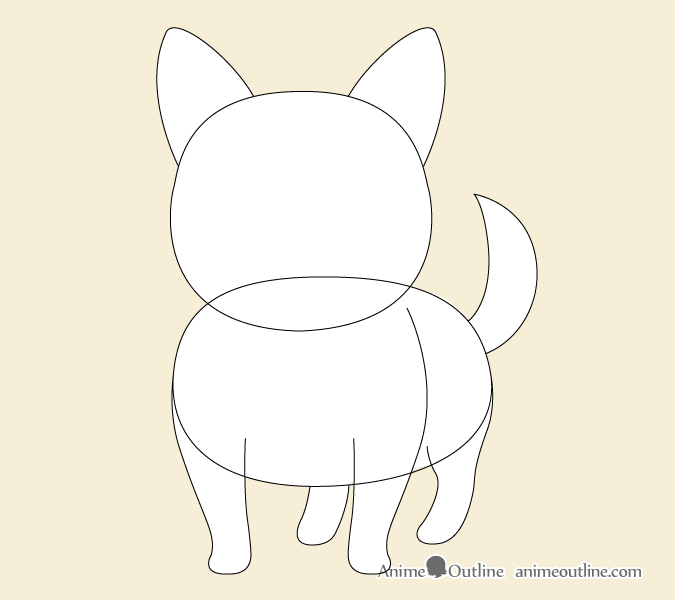 The places for a dog that fur normally tends to stick out in are the inside of the ears (especially in anime), the bottom sides of the head, the neck, bottom of the chest area and the tail. At this step you can finalize the outline drawing of the dog by adding the small details such as the pupils and reflections inside the eyes as well as the details on the paws. If you are drawing on paper be sure the leave the highlight areas blank. If drawing digitally you can draw them in over top later. Since the dog will be white there is not really much color that needs to be applied. Generally pink goes well with white and is also appropriate for this drawing. Color the tongue and insides of the ears (the parts that are usually not covered by fur) pink. Make the nose a very dark grey or black. Make the eyes just about any color you like or use blue like in this example. Keep in mind that the shadows change depending on the lighting conditions but in this case we will just use very generalizes shading that will work for most normal lighting conditions where light tends to come from above. Ad some very light grey shadows at the bottom parts of the various body parts of the dog. There will be some shadows on the bottom of the head, snout, body, tail and paws. Draw the shadows as somewhat tracing the outline of the shape of the dog (including the fur). 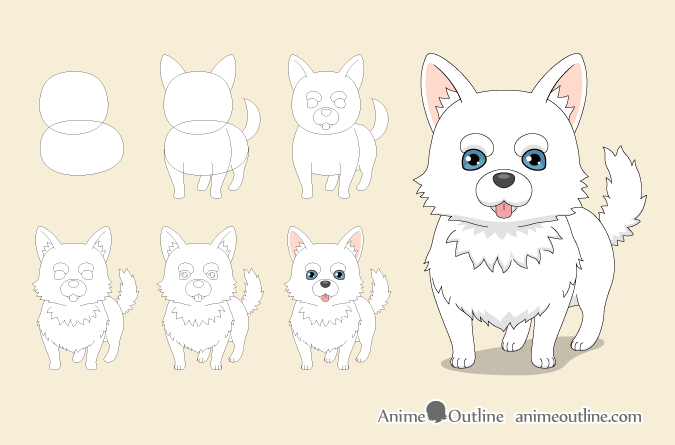 This tutorial shows one way of drawing a cute anime dog but obviously there are many ways to draw a dog in many different styles. 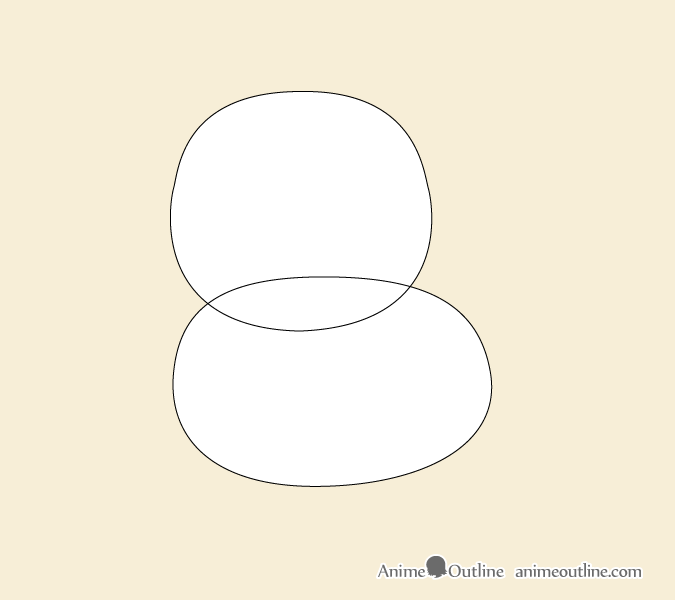 As suggested in many other tutorials here on AnimeOutline you can always look at some photos if you need more reference. 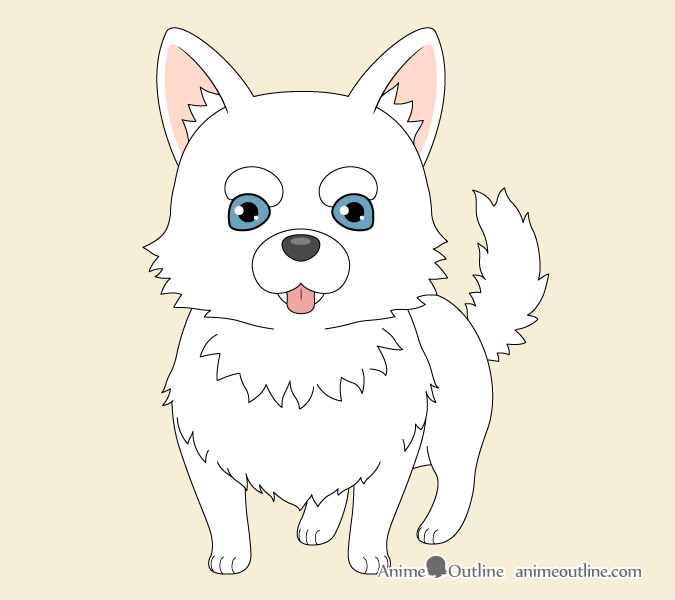 You can also look at how dogs are drawn in some actual anime and manga.